Where East and West collide, Turkey combines exoticism with luxury as it melds years of history and cultural influences being one of the oldest permanently settled regions of the world. Images of bazaars, Hammam spas, hot air balloons, Turkish coffee and Turkish delight are often called to mind when Westerners think of Tukey; though the region does offer these indulgences, it holds so much more. From “fair chimney” rock formations in Cappadocia to 18km long golden beaches in Patara, the landscape is as surprising and delightful as is the culture. Sail the Turquoise Coast, where the word “turquoise” is actually derived from the French word for “Turkish”, for an unforgettable experience. Begin your journey in Bodrum, the site of the ancient city of Halikarnassus. Visit the site of the Mausoleum of Halikarnassus—one of the Seven Wonders of the Ancient World—which is a worthy trip despite the monument’s destruction by an earthquake decades ago. Featuring numerous other historical sites, modern Bodrum has evolved into a city of luxury and is a popular sailing destination with unspoiled waterways and sleek marinas. Enjoy a day of sightseeing followed by a night out at one of the regions trendy beach clubs. Believe by the Ancient Greeks to have been personally created by Zeus, Datca lies on a peninsula between the Aegean and the Mediterranean seas. Its immense beauty is staggering, thus only a god could have conjured that particular shade of blue the sea takes on midday, or the rocky outcrops and miles of deserted beach. While your mind is at peace, ensure some physical relaxation as well at a hot spring, reputed for its healing powers. A marina on the southern bay has a selection of cafes, bars and shops, for a daytime excursion and if you happen to arrive on a Saturday immerse yourself in the colorful weekly market. Enjoy a refreshing summery treat as Datca claims to have the best ice-creamery this side of the Mediterranean. Tiny specks of color dotting the coast begin to come into view as you cruise over to the Greek island of Symi, 9 km from the Turkish coast. Symi appears to be created by colorful imagination of a young child with its lines of traditional, colorful houses quaintly perched in the mountainside. Quintessentially Greek, sail into a traditional harbor and enjoy a meal at a local taverna. The abundance of natural bays on the island are ideal for swimming and watersports if you’re looking for a classic Mediterranean day. The cosmopolitan city of Marmaris is the ideal spot for shopping; the kordon (promenade) is adorned with boutiques, markets and bazaars. Whether you’re searching for leather goods, gold or other designer labels Marmaris is the place to do your souvenir and personal shopping. If you’re looking for a taste of Turkey to bring home try some “Caam Ball”, a locally produced pine-scented honey. When you’ve had your retail fill, visit a Hammam Spa to revitalize yourself before heading out for a night on the town at one of the intoxicating nightclubs. Ekincik is a sheltered bay that has been visited by A-listers from Prince Charles to Sting. It’s no surprise people flock to the area with its multitude of activities from diving in Delikli Magara, to visiting the Sultaniye Thermal Waters mudbaths or cruising in a small local boat up the Dalyan River to the ruins of Caunos. Rimmed by Iztuzu Beach, see if you can catch a glimpse at one of the loggerhead turtles the beach is named for. 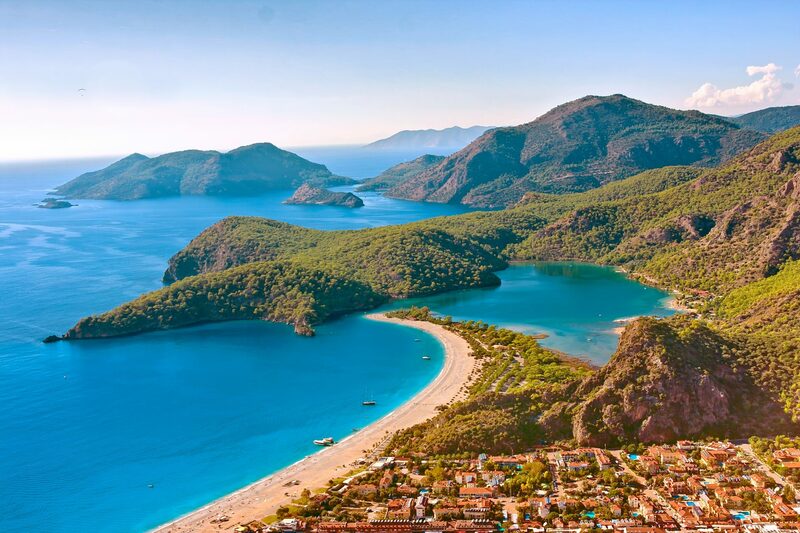 Bask in the sun on Oludeniz’s mile-long curl of pebble beach leading to its famous blue lagoon as you watch the red and yellow streaks of parasailers go by. On land, the bustling coast is filled with restaurants, hotels and cafes packed with sandy beachgoers. Underwater the blue lagoon is equally as populated with divers and snorkelers exploring the treasures of the deep blue sea. Nearby Gemiler is an isolated island where the remains fourth and sixth century Byzantine churches are located. Enjoy an evening hike up to the top of the island for views of Fethiye. Your final destination Göcek Bay aka Skopea Limani. Primarily a place for boating, try your hand at a gulet, a traditional sailing vessel, or take your water toys for a spin in the relatively empty waters.